Designed to reduce accidents in the workplace. Elevated, studded surface ribs and drainage holes combine to enhance traction in wet or dry areas. Includes 6" wide ramps on three sides for added safety. SPECIFY BORDER COLOR: OR - Orange, YL - Yellow. 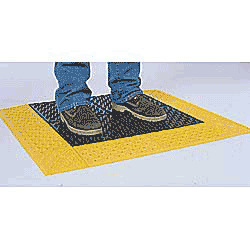 STANDARD MAT IN YL - YELLOW IS IN STOCK. Others FOB TENNESSEE. NOTE: Custom sizes available in 12" increments. Please call ZORIN (888) 378-6525 for details.